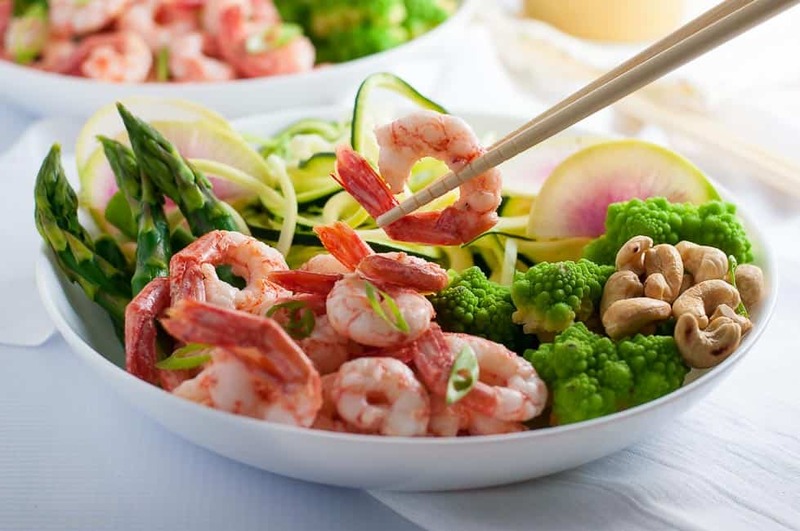 Grilled shrimp, raw zucchini noodles and crisp vegetables all drizzled with an intensely flavourful sesame miso vinaigrette make this Fresh Veggie and Grilled Shrimp Zoodle Bowl a nutritious lunch or a light dinner. I’d like to say that I’m one of those super-organized cooks who plans meals a week in advance and shops with a comprehensive grocery list. But I’m just not, and never have been. Most of the time, I just fly by the seat of my pants and wing it. I often find inspiration for my meals while browsing through the produce section. This Fresh Veggie and Grilled Shrimp Zoodle Bowl resulted when I spotted a beautiful head of chartreuse-coloured Romanesco broccoli and I knew I just had to have it. While shopping, I remembered I had a couple of those spectacular watermelon radishes in my fridge, and so I decided on a spring green and pink theme for dinner. While it sounds like a beautiful redecorating project for a bedroom, it resulted in a colourful and appetizing dinner. 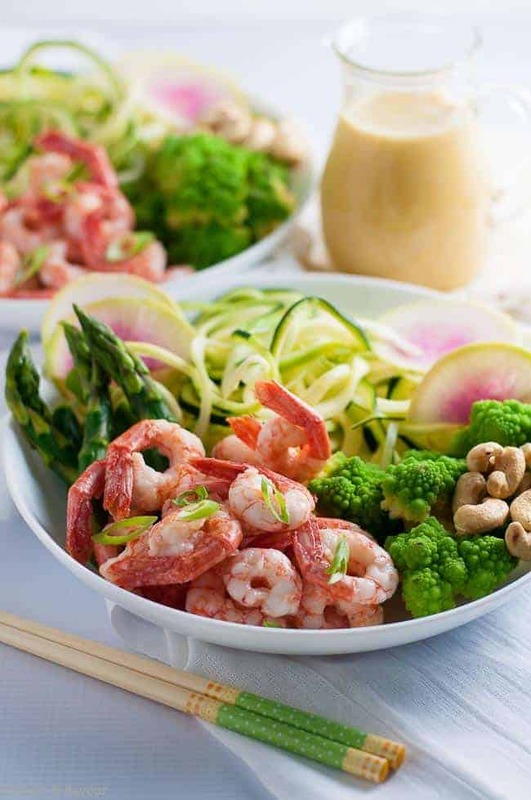 I added asparagus, zucchini noodles, fresh shrimp, green onions and a few cashews for a little extra crunch and our power bowl supper was born. 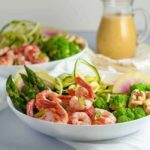 I had some Sesame Miso Vinaigrette left over after making this Asparagus Salad with Smoked Salmon on the weekend. It gave this meal-in-a-bowl some warm umami flavours and was the perfect choice to tie it all together. If you haven’t tried Romanesco before, look for it soon. It is milder than broccoli and it looks similar to cauliflower, but has a more delicate flavour. Most interesting to me, and maybe to you if you’re a math nerd, is that the spirals of florets on a head of Romanesco form a natural fractal, growing in a pattern that repeats itself and looks the same at every scale. This repeating pattern is a spiral based on the Fibonacci sequence. If you remember your high school math, a Fibonacci sequence is one in which every number after the first two is the sum of the two preceding ones: 1, 1, 2, 3, 5, 8, 13, 21, 34, 55, 89 and so on. But I digress. While it’s fun to examine a head of this beautiful vegetable and marvel how math is found in nature, it’s even better to enjoy its crunchy texture and mild nutty flavour. And speaking of delicate flavours, watermelon radishes add colour and crunch to a salad, too. I love that they seem so plain and unremarkable until you slice into their spectacular interior! 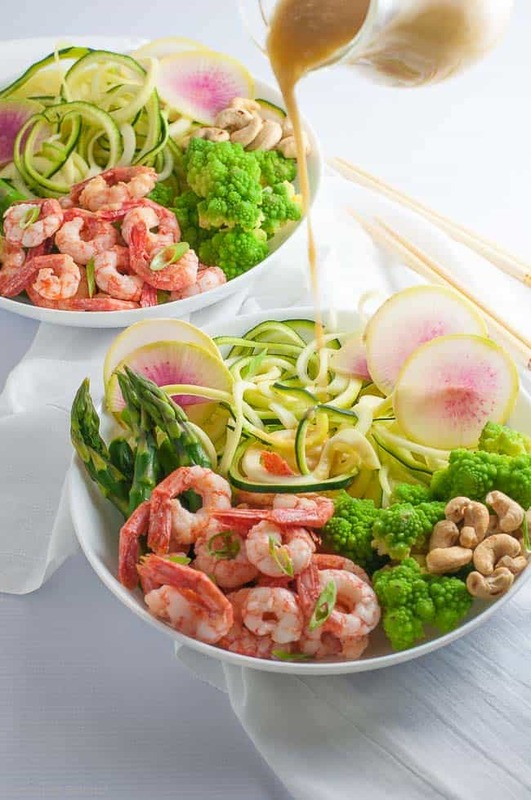 I spiral cut a zucchini with my spiralizer to make a bed of raw noodles, added some lightly blanched asparagus spears along with the romanesco broccoli, and chose sustainable local side-stripe shrimp to complete this paleo shrimp zoodle bowl. So if you see something that catches your eye next time you’re shopping, act on a whim, pick it up, and create a healthy zoodle bowl for your lunch or dinner! 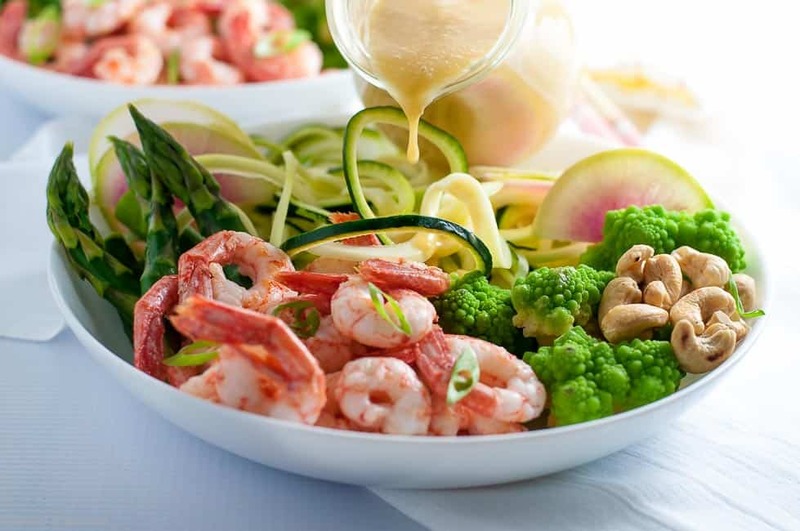 Grilled shrimp, raw zucchini noodles and crisp vegetables all drizzled with an intensely flavourful sesame miso vinaigrette makes this Fresh Veggie and Shrimp Zoodle Bowl a nutritious lunch or a light dinner. Blanch Romanesco broccoli florets and asparagus first. Place in a pot of boiling water for 2 minutes, or just until they turn bright green and have softened slightly. Remove from boiling water and immediately transfer to a bowl of ice water. When completely cool, remove and pat dry. 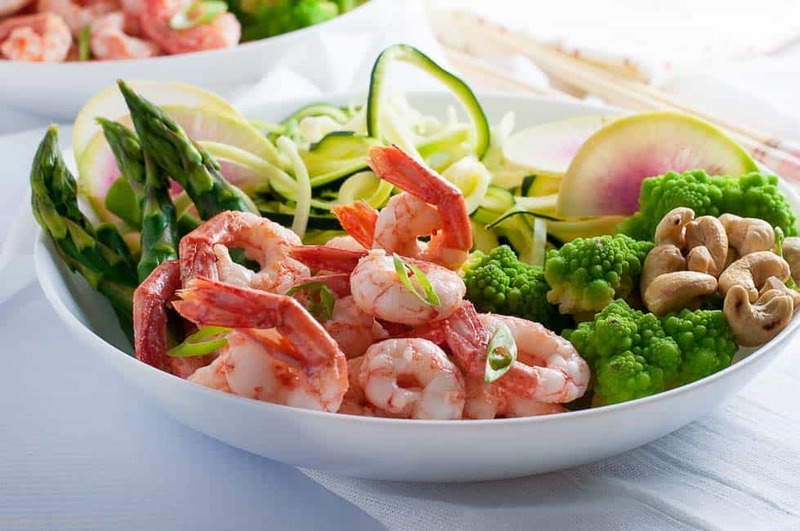 Cook shrimp or prawns on a grill or on the stovetop for 2 minutes on each side or just until no longer translucent. Arrange ingredients in a bowl and drizzle with Sesame Miso Vinaigrette. In a small jar, whisk the remaining ingredients until well combined. Add the toasted sesame seeds. 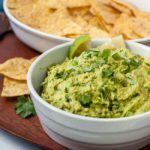 Calorie count does not include dressing. 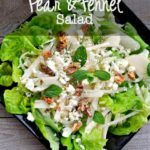 You will have more dressing than you will need for two serving of this salad. Store in a jar and save for another salad. I am terrible at math..I mean the worst! 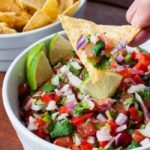 But, I love good food and this looks so fresh and perfect for spring! 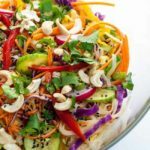 Would make great lunch prep for the week! You’re right–it would make a great make-ahead lunch, with the dressing on the side! Thanks Colleen, Agreed! Creating a dish can actually be a work of art! Wow! That is a showstopper dish right there! I could imagine that making its way in many al fresco menus this summer on our patio . Thanks for sharing. Thanks Denise! It has a killer dressing too. Great dressing. I made it today and also added some fresh ginger. Grated about 1 T into the mix. Thanks Tiffany! That’s such a good idea!